In this section, we will update more in-depth details about what Young Gorvernors have been doing. For example, you can read about projects, events, training, etc. Today is kind of an odd day. I spilled coffee on my hair and winter hat while rushing to class in the morning. I forgot my school ID, therefore, I cannot print any documents and wouldn’t have been able to get into the library if it had not been for my very good friend who swiped her ID card for me. I submitted the uncompleted version of my assignment for class. And it happened to be a very cold and rainy day until the very end. However, I am writing this post because I feel a sense of peace and pure joy surging inside. Only four hours ago, I was sitting in the working office of Young Governors. They claimed themselves to be community organizers and belong to a youth program that has been run for four years by a social worker. Paying them a visit today, I witnessed how committed they are towards doing extracurricular activities. 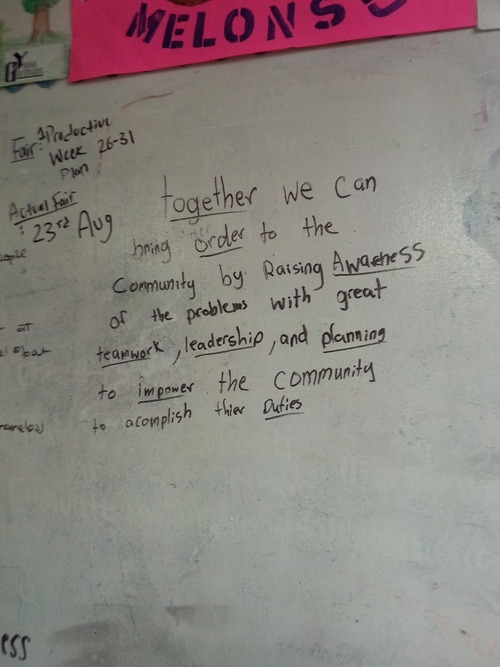 Indeed, they spend a great amount of time with each other, learning how to express their opinions, facilitate workshops, promote community events and contribute to the community that they live in. Usually, high school students start doing community services or joining organizations for selfish reasons, such as polishing resumes to get into a good college (there are exceptions of course). Certainly, this group of young people were joining Young Governors for the very same reason in the first place. The program even promises to give them stipend as long as they treat their community work as a job! As I talked to them, Tony told me that he got involved because video games don’t give him a sense of accomplishment. Another friend shared with me that she didn’t have anything else to do with her life. That was very understandable because not everyone knows what he or she likes or wants to pursue when still in high school. These students (mostly Asians and Hispanics) often come from immigrant families whose parents don’t speak English at home and are also authoritarian parents. The kids are not provided with many opportunities to learn how to be proactive or socially adept. They also go to New York Public Schools which are notoriously plagued with many problems. Therefore, many are self-conscious, not confident in their academic or social abilities and recoil from dreaming high. I can’t count with my fingers the number of time some friends in a public high school telling me: “But I am stupid.” Nevertheless, Young Governors seeks to trust and empower youth. Teenagers in this program are presented with many opportunities to talk in public, work in various teams and mingle with strangers. They are treated with a lot of respect, patience and trust. Of course, it is challenging and very time-consuming to deal with rebellious teenagers, but once these young people sense the trust that adults have in them, they will be capable of things that put everyone in awe (I am by no means implying that the teenagers in Young Governors are rebellious. In contrast, they are respectful and sensible). For example, my friend was starting out the program because of money mostly. He hated team work, doing events and constantly didn’t show any interest in whatsoever the team was discussing about. That was when he was fifteen. Now, he is the charismatic 17-year-old leader of the program who is responsible for training younger members. He told me that he wants to be a social worker and indeed, he has been looking into colleges that offer a good program for social work. It is heart-warming to see how such a young person genuinely finds joy in making the world a better place and wants to pursue social work as a career. It takes a lot of courage and kindness to dare to dream of becoming a social worker! I remember last year, these young friends were hesitated from talking to strangers to introduce who they are and pitch their ideas. Now, because they have been encouraged to do this job so frequently, they communicate with much more confidence. If only there were more youth programs such as this in the world, we would face less social problems that cause the stereotypes related to teenagers. 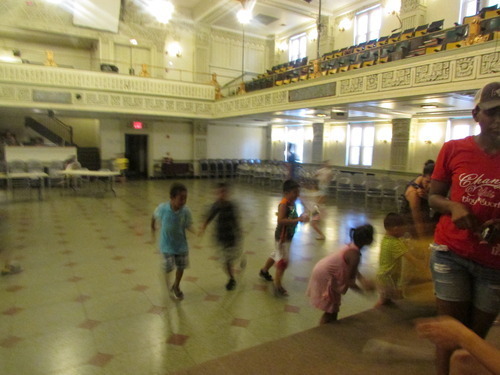 Kindness in this youth program has a domino effect. Young people haven’t experienced much of life. They are less cynical, more genuine, kinder, more heart-warming than a lot of adults. In this program, I witness how these teenagers help each other do homework, review for tests and give advice to each other. I saw my friend T. sit for almost an hour explaining the Global History homework for another friend. I caught a glimpse of another peer joking and fixing his friend’s essay for college. Indeed, I was overwhelmed when some teenagers, younger than me asked: “Nhi, do you want me to teach you how to use the DSLR camera?” or “I can definitely teach how to use Photoshop” or even “Do you want my food?”. I remember when I was at their age, I only saw how teenagers in school would gossip about each other. Now, in this program, there was hardly any judgement or offensive remarks. 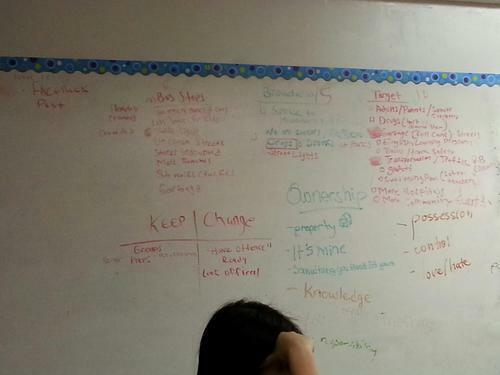 Yes, conflicts did happen, but I am confident in seeing progress and character building arising from their arguments. Today, I helped a high school sophomore fix her essay during my visit, and before we said Bye, she suddenly hugged me. We hardly talked before that, and I helped her mainly because of my own interest in editing. But she put her arms around me and smiled before running to catch the bus under the drizzle. I was moved. They used to be strangers but now are all brought together for a greater cause. Older kids helped younger kids develop social skills and character. Older kids empower younger kids. Somewhere, kindled in the youth are the flames to do good things, to give back, to love, to forget and to feel happy. Perhaps, one of the most important achievements of this program is that it inspires the teenagers to step out of their own world and engage more in the lives of others. Being a student is tough. Being a good student costs a lot of time. Social media are tempting. This series on Netflix makes us sit all day in bed with a bag of chips beside. Video game certainly has its charm. Sometimes, it is difficult, very difficult to learn to think for other people and do good things on a constant basis when our lives still have so many problems and distractions. Yet, if there are more programs that connect young people to the community, these young souls will be blessed with wisdom and compassion. They will learn to care and take initiatives to make a difference instead of evolving into an adult who pursues only things with material values or easily succumb to plight. Furthermore, the more we grow up, the more responsibilities we have to bare. Thus, in my opinion, adolescence is the best time for anyone to better him/herself. Well, if only more youth programs similar to Young Governors were created and more funding was given to reinvest in youth. 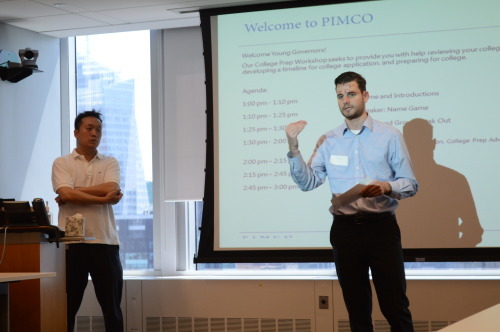 Last Friday, July 25, thanks to the generosity of PIMCO volunteer team, our teenagers had a chance to visit PIMCO office, get individualized help for college preparation and receive constructive advice from PIMCO employees. After the fun ice-breaker through which we had a chance to mingle with the adults, two teenagers were paired up with one employee to consult with. The PIMCO employees were extremely helpful and friendly. They didn't hesitate to answer any questions regarding college admission process, read through the college essays that the teenagers had prepared, share their experience in colleges and listen to us express the concern about career choices. After that, the youth also had a tour around PIMCO office, having a glance at how people worked in the bank and understanding more about finance as well as PIMCO. It was an entirely new experience to see such a professional space. 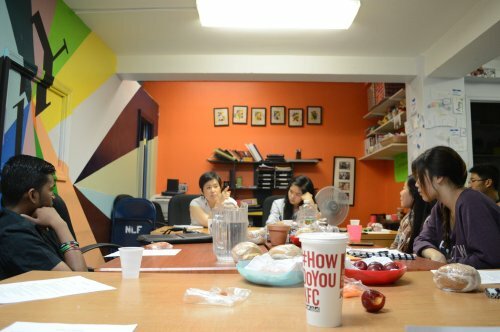 We are thankful for all the volunteers in PIMCO, who took out their time to meet and help our teenagers. Many of our team members are still preparing for college applications or the next chapter of their lives in college. Thank you so much and we won't forget such a memorable day! Last Saturday, July 19, the prospective Young Governors Corona successfully accomplished the last day of their community organizing training. 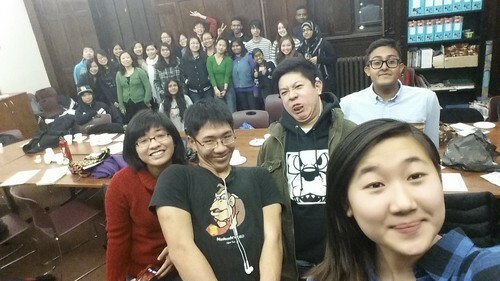 The diverse group was composed of over fourteen teenagers, coming from different schools and cultures. As different as they were, the trainees proved to be passionate about what they were learning. They dedicated a large amount of time to coming to Young Governors: Wednesday from 4:30 PM to 7:30 PM and Saturday from 3 PM to 6:00 PM. As the meeting days for Young Governors Elmhurst are Tuesday, Friday and Saturday, Delia (the director of the program), Tala (the young facilitator), Sandy (another facilitator), and Shirley (a new YG recruit who has been involved with the new branch) spent most of their evening time during the week planning for Corona trainings. Shirley Wang, currently a junior in High School for Arts and Business, received the training in January of 2014 with the intention that she would be part of Young Governors Corona. She shares her experience with the trainees, coordinates meetings and is learning to facilitate at the same time. Sandy is the co-facilitator for Young Governors Corona. Sandy joined Young Governors program in 2011 when it started. Now, as a college student, she decided to spend her time guiding the teenagers to become community organizers. Going through the planning process, Shirley expressed that for the first time, she learned how a leader felt. Joining the training in January was entirely different from helping it out in June. Yet, "it was fun," she said. Shirley became better at understanding people and gained more leadership skills thanks to joining the Young Governors Corona team. She said that the group was different from the Young Governors Elmhurst. They talked and worked in another way. Launching Young Governors Corona was exhilarating, yet it was not easy. For over two months, every Friday, Delia, Sandy, Tala and Shirley stayed late at the Young Governors' office, after the Young Governors Elmhurst meetings, to discuss about how they should make YG Corona happen. It was their dream to expand the unique model of the program to as many places as possible, bringing new opportunities to high school students. 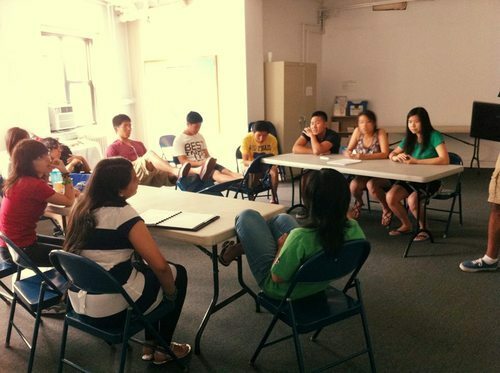 On July 11, Emiko gave Young Governors a workshop on planning that would definitely help them develop their future projects. 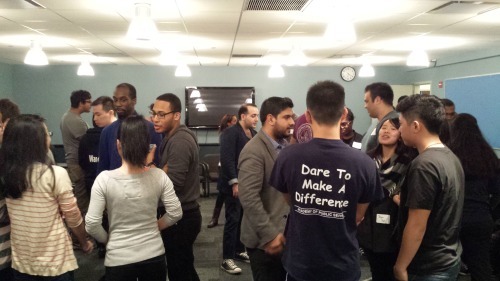 She gave them advice about how to manage time, organize events and narrow down the topic. Thanks to generous people like Emiko, the program is able to provide youth with useful workshops that will educate and empower them to contribute to their community. Stay tuned! For Young Governors, it has never been easy to choose a project idea to implement. It is not because they lack ideas or passion for solving community issues. On the contrary, they have discerned so many issues that it becomes difficult to narrow down and choose the topic that affects them and everyone in Elmhurst Community most. After months of discussion, they have finally chosen STEREOTYPES. The decision is based on their Community Assessment: interviewing people who live in Elmhurst Community, talking to teenagers, organizing workshops. However, it will be a new challenge to come up with what they will do solve this serious problem. Stay tuned and if you can, support by sending us your ideas about stereotypes! Any ideas or stories count. We would like to thank all the guests who donated/spent your precious time coming to our fundraiser. Without your staunch support, this program could not be where it is today. Young Governors and Young Volunteers at It’s My Park Day Event on last Saturday. Please click here to see more images. 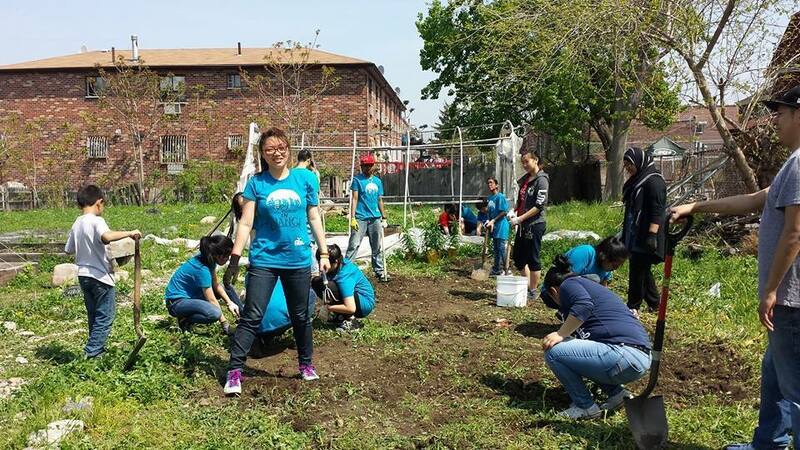 On May 10, the Young Govenors and the Young Volunteers joined the 2nd beautification event in Elmhurst Community Garden. Under the beautiful weather, they did their work: contribute to the community! We would like to thank all the guests who spent your precious time coming, listening to our stories and offering advice to our teenagers. Without your staunch support, the program would not be what it is today. Our Young Governors on the trip to Baruch College. Baruch undergraduates from the school’s Student Government spent their time during Spring break coming and discussing with our teenagers about leadership and college experience. Denise Patrick, Professor of Corporate Communications at Baruch College, has welcomed the teenagers with great generosity and shared priceless advice about leadership and communication. Other undergraduates also helped the teenagers by answering their questions about college experience, leadership and career pursuit. 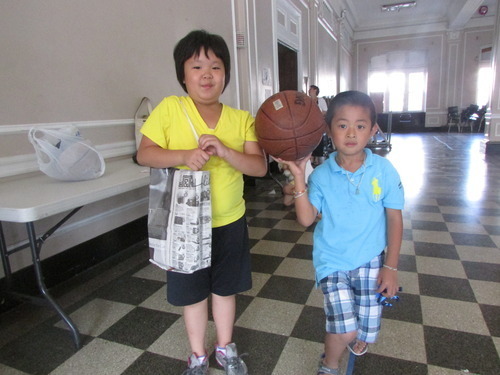 Joining The Scavenger Hunt in Elmhurst area has become a tradition for Young Governors each year. Exploring different locations in Elmhurst, the teenagers develop in-depth knowledge about the community that they will be working for in future. 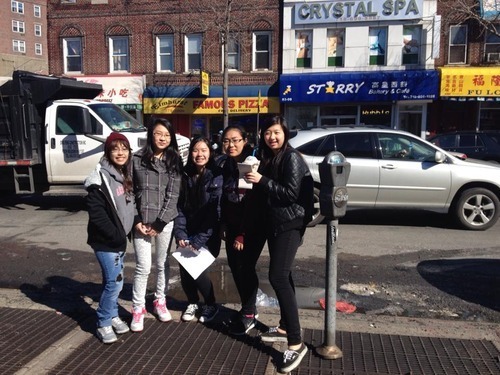 On February 22, under the beautiful weather, Young Governors 2014 engaged in a two-hour adventure in the local areas. Divided into two teams: “Awesome” and “Rocket”, the young community organizers got out of their working room at 11 a.m. During the two hours, they went to many locations such as Broadway park (where the veterans organized many events), Cafe Hooloo ( which has partnership with our program), looked for signs and talked to residents to accomplish their “missions”. 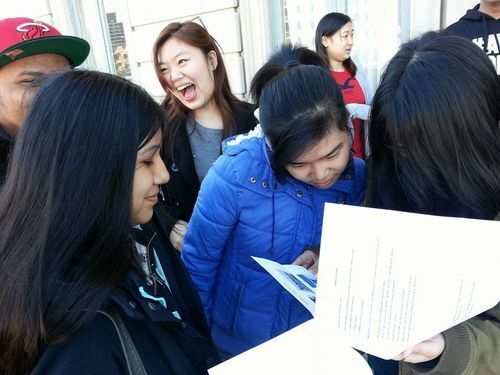 Katherine, a member of team Rocket, commented that thanks to this fun Scavenger Hunt, she had “learned more things about the community” and the residents. Katherine came to food places she had hardly known before, learned about a man who lived in Flushing for thirty years and loved her experience. 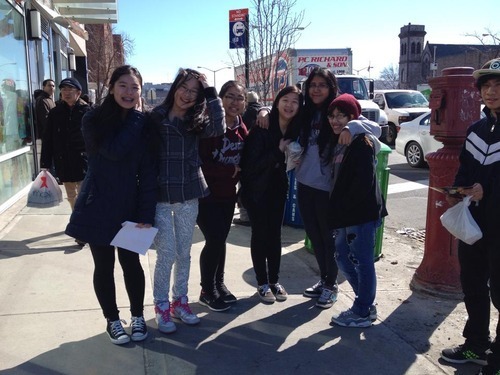 Merlyn, a member of team Awesome said that Elmhurst people were nice as they did not hesitate to give the team advice during the Scavenger Hunt. She learned that a lot of people had been living here for twenty years and felt more knowledgeable about the area. 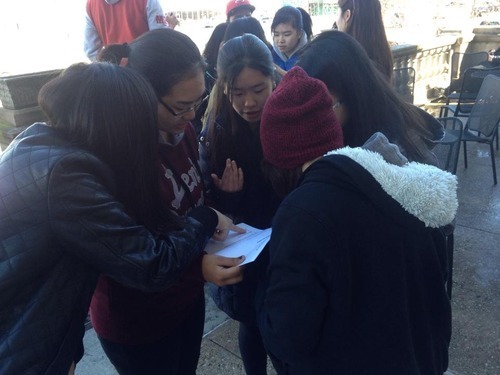 During the evaluation of this activity, Jennifer, a member of team Awesome declared that the team work was “impeccable”, since the teammates worked together, discussing about locations, strategies, directions and so on. All of the Young Governors gave this activity 4 out of 5 stars, sharing that the only moment that was not fun about this Scavenger Hunt was when they could not find places or people described in the guidelines. 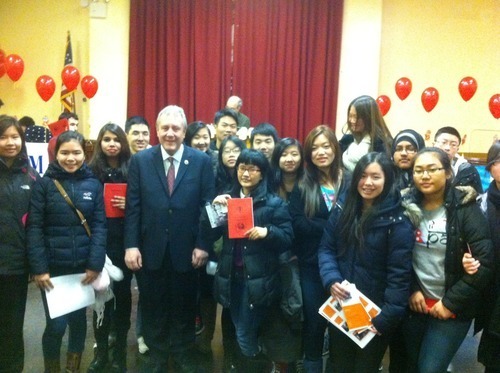 On Sunday afternoon, February 16, the Young Governors and Young Volunteers joined the parade and resource fair in the fourth annual Lunar New Year Celebration hosted by Council Member Daniel Dromm in Elmhurst, Queens. On the red table labeled “Young Governors”, the group displayed photos, brochures and scrapbook that demonstrated what the YGs had accomplished during three years working as Elmhurst Community Organizers. Admist the community atmosphere in the Elmhurst Memorial League where many organizations and residents also attending, 4th year YGs presented about their programs to people inquiring. They mingled with the representatives of other social groups, enjoyed various traditional dance perfromances and conversed with Mr. Dromm, thanking him for supporting the group throughout the years. Mr. Dromm, who has helped make the Young Governors program what it is today, complimented on the fantastic job the group had done for the Elmhurst Community. He also applauded the teenagers for maintaining the Elmhurst Community Garden, which was transformed from an eyesore into a place that grows nutritious food for the low-income families. Prior to that, the teenagers also participated in the parade from CC Moore Park to Elmhurst Memorial League. The weather was icy; the roads were wet and slippery with melting ice. Together with other residents, the YGs and YVs paraded along Broadway with the enthusiastic dragon dancers, drummers and other community members. The Community Organization Training for high school students has expired. During this week, ten people have been chosen from the group of 28 trainees to become the Young Governors 2014. They will sit in the official YG working room, debate, get training, get paid, do research and take actions to tackle issues in Elmhurst Community. To compliment on the arduous efforts the trainees had devoted to the one-month training, YG program organized a great small celebration with pizza and beverages for the trainees to enjoy while sharing their experience, thoughts and writing their reflections after the YG training. On this day, the trainees also paid kudos to each other for the great work during the mini-projects. According to the YG leaders, this was a way for the members to “acknowledge people’s contribution”, thus strengthen the teamwork connection and encourage them to reach their best potentials. 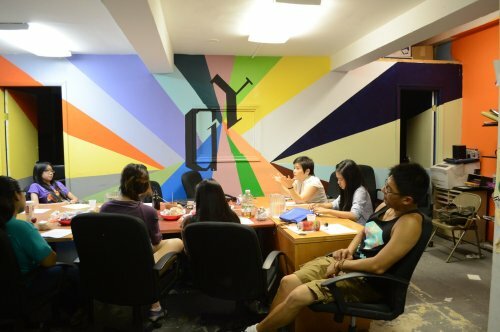 Delia Kim, the director of the program, shared with all the trainees: “Not receiving the phone calls [that accept them to the program] does not mean that you are not worthy of getting in. As far as I am concerned, everyone is able to become a great Young Governor.” Indeed, the criteria for choosing Young Governors are not their performance in the trainings, but their house locations, availability for the program and attendance/ lateness in the trainings. On Friday February 7, the new Young Governors had their first meeting with each other. 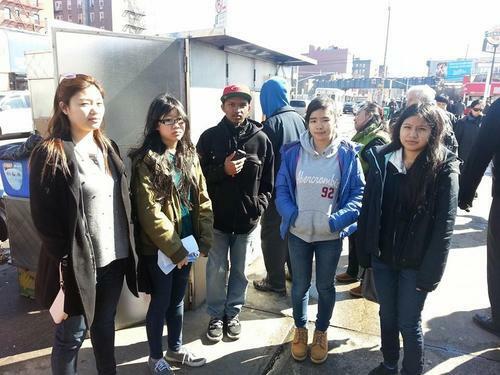 According to Delia Kim, they would continue receive training related to community organization and do actions simultaneously to apply what they have learned. On January 31 and February 1, the Young Governors trainees launched their first mini community projects. These events mark a significant transformation in the Community Organization Training, since last year, the participants had not had the opportunities to implement their own projects. 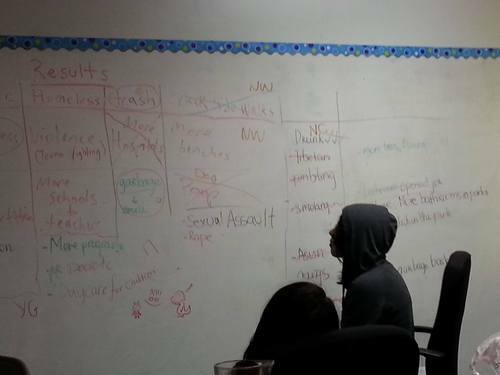 Guided by the YG veterans, the two groups came up with community topics which are Littering and Bullying. The first group, led by Stephen Sam, after the painstaking research, had produced a short movie touching on this issue. All the works: filming, acting, script writing and editing were carried out by the participants themselves in one week. 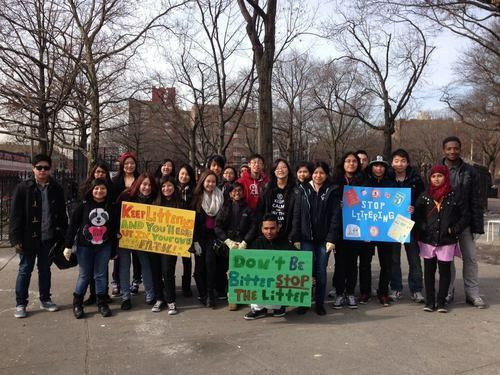 One day later, the second group, with the leading of Tony Fang, carried out their clean-up project in Broadway Park. 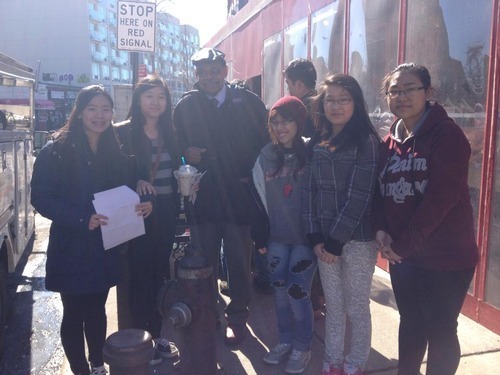 Kerlisa Ramkissoon, a freshman shared that thanks to this project, she felt more knowledgeable about Littering – a subject deemed controversial in Elmhurst community. Ramkissoon spent one hour to finish two conspicuous posters that clearly delivered the message the group wanted to share with Elmhurst residents. “Don’t be bitter, stop the litter” and “Keep littering and you will end up in your own filth”, the two posters said. The weather on Saturday morning was slightly icy, yet not windy. The thick layer of snow had melted; the sky was bright and cloudless. 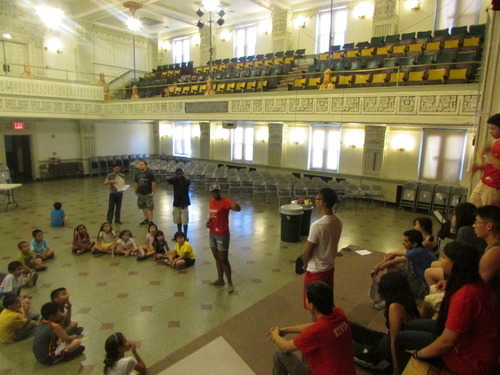 At 11 AM, The Young Governors Trainees eagerly set out to Broadway Park. Melissa L. Villodas, an intern in New Life CDC who accompanied the group on this day complimented on the event. “I think it is great…It is good that they are keeping the tradition and staying focused on their goals, ” she said. Indeed, Young Governors had been doing this voluntary work in Broadway Park, which was filled with trash, bottles, cigarettes, nylon bags since 2010. 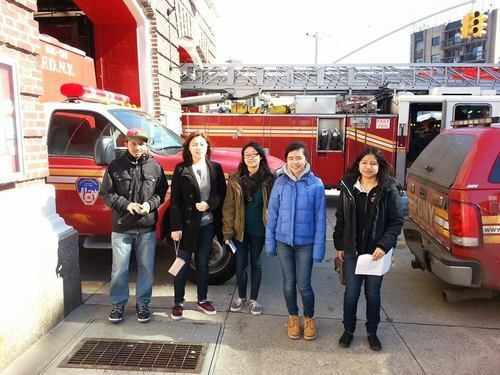 Tenzin Tsepak, a sophomore in New Town High School stated that his group wished to do this event to raise awareness in the community. “Many people litter because they don’t know the consequence,” he said. Merlyn Bonilla, a sophomore from High School of Arts and Business, while picking up garbage shared that she felt “disgusted by people littering”. Other YG trainees excitedly talked about their experience. “I feel like a different person,” “This old lady says God bless you kids…She said she is gonna pray for us,” some said in happiness. Lizhong Zhang, however, also straightly expressed his opinions. He wished that more people would be on time and there should be better preparation. Several people were not equipped with gloves to do their jobs. After the event, the participants came back to the Upper Stage Room in NLFC to join an evaluation, where they could discuss, share their feelings and ideas. Some felt proud and accomplished. Some said they had done a great thing for the community. Some were thrilled by the appreciation from passers-by. “Coffee cups, bottles, newspapers were everywhere. Now it is all gone,” a trainee declared. From all the projects, the Young Governors program wants to challenge the stereotypes thrust upon youths, wishing people to realize that there are young people who do care to make a change in the community. Last year, while the prospective Young Governors merely sat in one room to receive the training, the 2014 agenda gives participants more hands-on opportunities. Divided into two groups, they come up with problem-statements, do research about Elmhurst Community and will implement their actual projects. 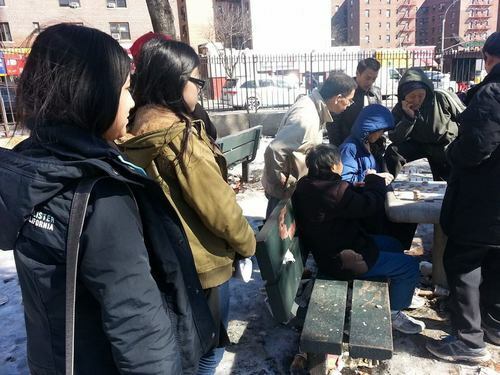 Under the careful instructions from the veterans, two groups went out to do community assessment in the icy weather, asking the local residents for their input. “We want you to get out of your comfort zones,” said Delia, director of the program, to the group of youths. Before discussing about their own projects, the participants had an interesting conversation about the saying, “Give a man a fish, he will eat for a day; teach him how to fish and he will live for a lifetime.” Under the warm yellow light in the Upper Stage Room of New Life Fellowship Church, the teenagers expressed their opinions in confidence and energetically added on to what each other said. 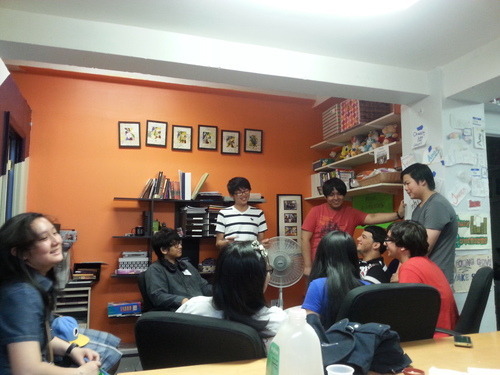 The atmosphere was incredibly comforting; some cracked jokes and people burst into laughter. Furthermore, the youths proved to have wide knowledge about local and national issues though the discussion. On January 24, Celia Castellan, a community organizer from Transportation Alternatives also paid a visit to the Young Governors training as an observer and speaker. Elaborating about her organization, she said that her group fought for safer streets, advocated bicycling, walking and public transit. Ms. Castellan, after witnessing the training, commented, “This is phenomenal,” and emphasized the importance of having a group like this in the community. 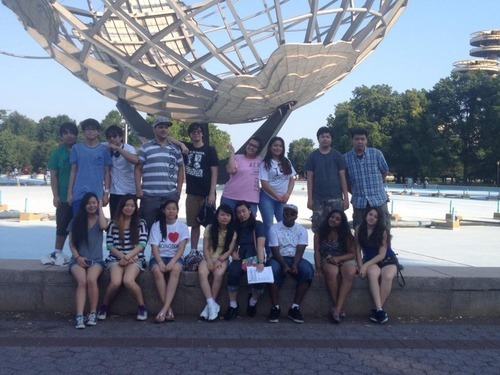 On August 17th, Young Governors 3rd year launched their first community project in Elmhurst Park. 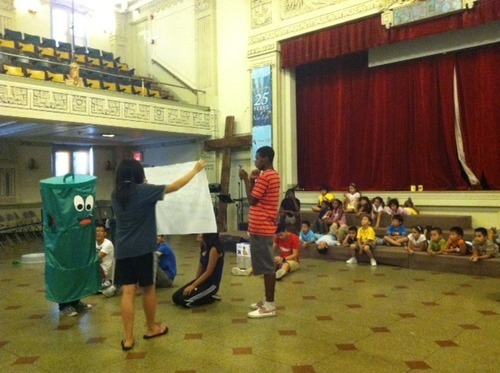 Called "Go Green Elmhurst", this event attracted almost a hundred kids who came to this park. Many parents shared how thrilled and thankful they were by the laborious preparation as well as devoted spirit Young Governors had put into coordinating this event. For people who have no idea what "Go Green Elmhurst" is, it is an event by Young Governors 3rd year, who desperately want to tackle the community issure "Pollution". In this event, they came up with three "green" activities for kids, a performance and a speech, in hope of educating kids about environment protection and inspiring them to "get involved". The event lasted from 10 am to 4 pm. The weather was at first cool, but got hotter as the time passed. From around 10:30 to 11 am, the Young Governors and Young Volunteers spreaded out around the park to advertise about this event. Some people got curious and brought their kids to join the first activity: "The Scavenger Hunt"
In this activity, the kids tried to find plastic bottles, which had been scattered around the park before by YG members. They had to put what they collected in the newspaper bags. Of course, there were YG supervisers who accompanied the kids all the time. After giving out prizes and telling the kids to always remember picking up trashes scattered in the street like what they did on the Scavenger Hunt, Young Governors divided the kids into two group. One group learned how to make bags from newspapers; another group can draw anpain on bottles about environment, plant seeds and take what they did home. 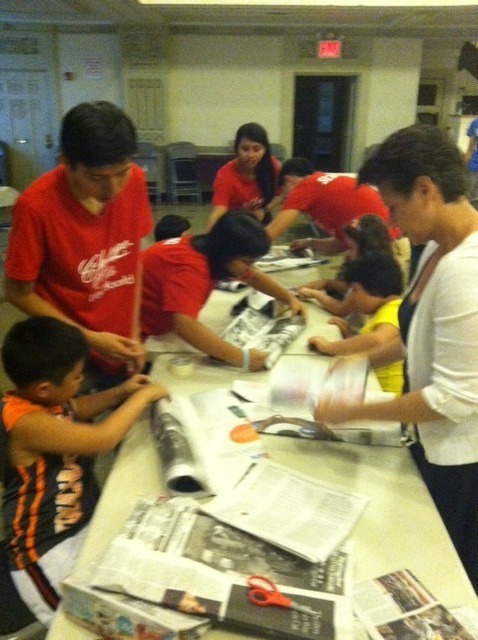 In the newspaper bag table, the YGs were trying their best to guide kids through some complicated steps of the making process. The weather was burning; yet, the kids were eager to learn. All the bottles that YGs prepared for paining activity were used on this event. There were many bottles with beatiful and creative drawings. 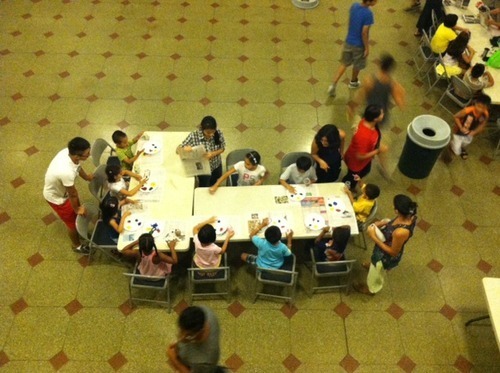 Moreover, those kids' artworks prove how they can learn to care for and love the environment. In the advertising table, Young Governors displayed brochures of the events, and some sample of recycled crafts. 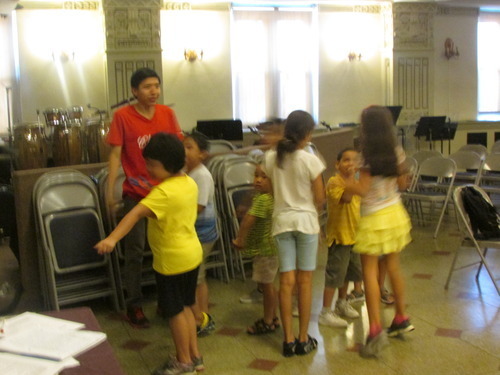 At 1 pm, Young Governors hold a performance, in which they reenacted scenes from the Frog moral story. After that, a speech was delivered with all the messages YGs wanted to spread to parents and children. They wished to spread awareness about pollution, tell parents that protecting environment means protecting their kids, educated children about the importance of keeping the earth green. "...The environment will be polluted more, global warming will speed up, the cities I am living in will be submerged under the ocean, and even more terrific, the ones who will be directly dealing with diseases, and natural disasters because of pollution are not us, but the children. The small kids you are holding, and caring, and loving each day, can you imagine they will be the victims facing the consequences of what we are doing today to the environment? Don’t let it happen. Be deaf to negative saying that we can’t do it. The solutions are in our hands, so why don’t we do it to save earth – our only homes and save our children – the ones we love?..." At the end of the event, everyone was tired, but the memories of "Go Green Elmhurst" would be encarved in their minds forever. Summer Boost Kids: Who are they? 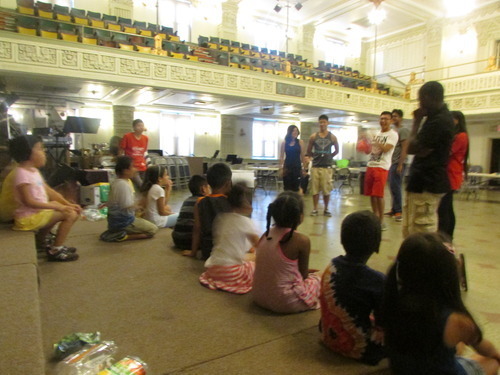 They are kids who currently join the 2013 Summer Boost Camp at New Life Fellowship Church in Elmhurst. 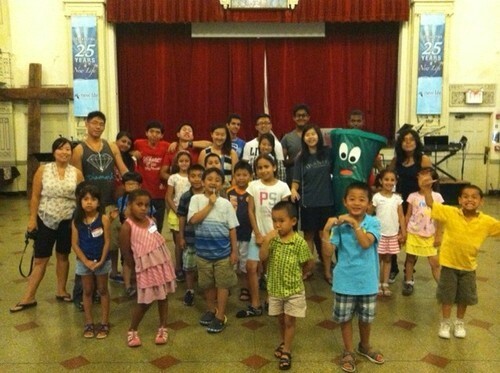 Why “Go Green Elmhurst” with Summer Boost kids? To make sure that our real events in the parks will be as successful as possible, Young Governors had decided to run a practice event on last Friday (Aug 2nd) with about 20 kids in the Summer Boost Camp. We ran this practice event not only to test the outcomes of our planned activities, but also to bring fun and teach these small kids about 3R. What happened? Did the kids have fun? Did the kids learn something from our event? The event started by Young Governors introducing ourselves in front of the small kids. They looked at us with those curious and innocent eyes, feeling excited about our event. Some kids even called some YG members’ names out loud, since they had been knowing us who also worked and volunteered in Summer Boost Camp. It was a relief when the kids are open to us. After introducing ourselves, we told the kids briefly about how we need to protect the environment by 3R. To my surprise, those kids have already known that 3R means: Reduce, reuse, recycle. They shouted those words out so enthusiastically, which somehow made my heart drop to think about how some adults who don’t even know what 3R means, how a lot of people are polluting the environment, and how these kids will grow up facing more natural disasters, more pollution, more diseases than we do right now. We started the event by the Scavenger Hunt. The kids were divided into two teams, each team was led by one YG member. 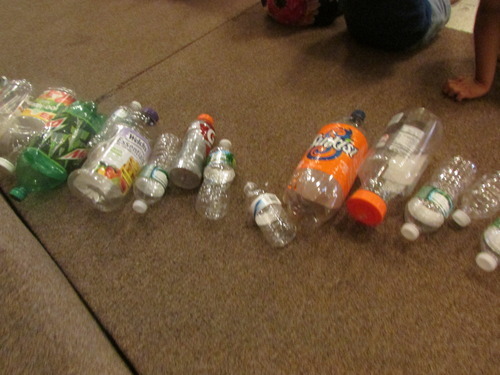 And their challenge was to collect as many bottles in the room as possible. 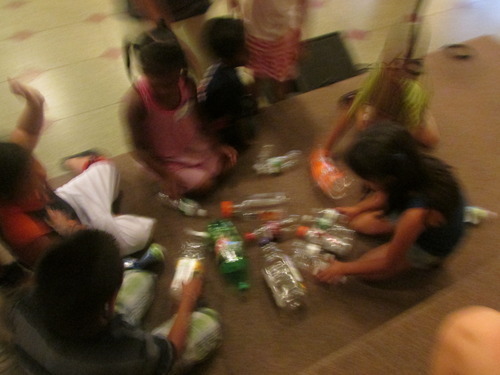 It was so difficult to take a good photo because the kids were running around fast to find and collect bottles. Look at how many bottles they had gathered! After the Scavenger Hunt, we gathered the kids into a group, gave every one of them candies as prizes, and told them the purposes of our game. 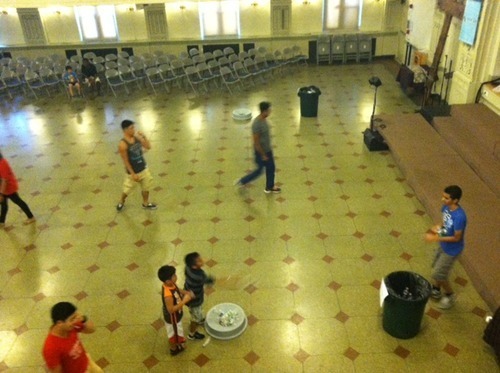 We told them that whether their team won or lost was not important, because the whole point of the game was just for them to have fun, and to remember that next time, when they saw bottles scattered in streets, pick those up and throw into the garbage cans. "So, next time, when you see bottles littered in the streets, what will you do?” Happiness swelled inside me to hear their voices echoed somewhere: "We will throw the bottles into garbage cans!" 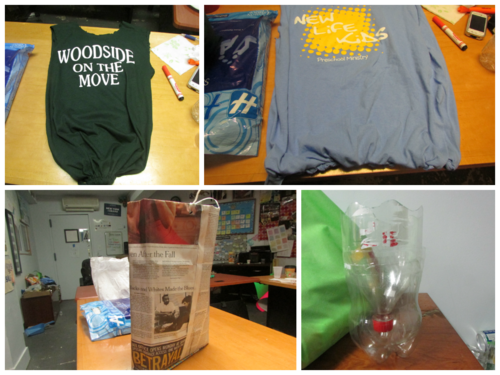 In the next 30 minutes, we organized three different activities: can tossing ( in which the kids will throw bottles and cans into garbage cans from a far distance), learning how to make paper bags and painting the bottles. 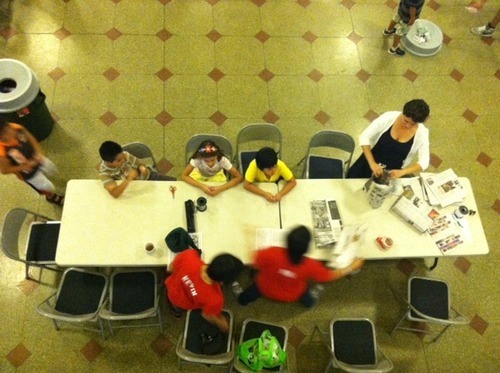 The kids were waiting to learn how to make bags from newspapers. At the end of the event, we hold a performance in which the main character is a Trashy who teaches kids about recycling, reducing and reusing. The kids loved the performance, even though we YGs are not professional actors and actresses. And more important than ever, they learned the message from our show: protect the environment. I couldn’t stop smiling when looking at this photo. She loves the newspaper bag. As it happens, Young Governors are in the process of rigorous planning for the two "Go Green Elmhurst" events, which will happen in Elmhurst and Broadway Parks in August. So, what are these events about? 1) A Scavenger Hunt: participants will be competing to see which team can collect more recyclables like bottles or cans around the parks. So….bring your kids, your younger sisters, brothers! They will have fun joining our “green” adventure, and what could be more awesome that seeing how your kids learn to be aware of protecting the environment through only a small game? 2) Making eco-friendly craft projects: we will teach you on how to make bags out of T-shirts and newspaper or how to make use of thrown-away bottles. It will be fun, we promise! If you know how to make them already or even have more ideas about recycling, please don’t hesitate to tell us and come to our events. We really need more people, more advice and feedback to make this events as successful as possible. Yes! If you like it, we will paint your face with nice designs ( which are related to environment, of course). Come! Kids love it, and teenagers like us love it too! We absolutely plan more than just 3 activities, yet more information will be updated later because we are still revising other activities. Thank you for reading. We really appreciate it. Currently, Young Gorvernor program is running its third year and the Young Gorvernors are in the process of planning for their events, which will happen soon in August. 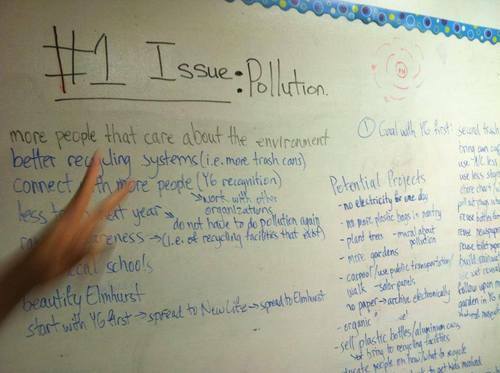 The events are all related to one main topic: POLLUTION. But why did they choose this issue in their community to tackle? It was not simply because pollution is what we see in the community. We did not choose this issue from merely our perspective! Indeed, we carried out the Community Assessment, in which we went out of our office, talked to many people from many places in the community like: bus stop, stores, parks…etc and gathered hundreds of results about what issues in the community that disturb people. We then based on many factors, such as the issue that receives highest number of people complaining, project potentials and even a debate to find out what issue we will be sticking with for the rest of YG year. It was a interesting, but serious and straining debate that lasted for almost 3 hours. We have been working rigorously many days to prepare for the events. Of course, nothing is perfect and there are still flaws, but we are learning and working. We put our hearts into work and hope to create a better community.